Unlike many other locks that advertise being resistant to bumping and picking ASSA locks are actually nearly impervious to such attacks; The locks utilize a sidebar and 5 additional side-pins that ride on an extra set of cuts on the side of the patented ASSA keys. Additionally they are equiped with stainless steel security pins and hardened steel inserts to prevent drilling. ASSA Twin and V-10 cylinders are among the most secure locks on the market and because the key blanks are restricted employers can be assured that employees will not be able to make unauthorized copies. Have you recently fired an employee and are unsure whether that employee has copies of your keys? We can provide you with a set of new keys for your business the same day. If you carry a lot of keys for different apartments or offices a masterkey system can save you a lot of time while retaining full access control. We can help you set up a new one or expand your existing system. For insurance reasons, Apartment Complexes should rekey every apartment after someone moves out. This can cost thousands of dollars per year and many management companies try to cut corners by switching their locks to user-rekeyable devices, oftentimes leaving their tenants' apartments vulnerable to break ins. 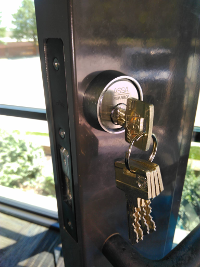 Interchangeable Core locks are the ideal solution for this: After a tenant moves out the property manager can use the provided control key to pull the core and replace it with another one. Using a lesser known or, ideally, a patented keyway reduces the likelyhood of the tenants making unauthorized copies. More expensive locks are available that require the control key to be present for the lock to be disassembled saving on replacement costs, as many tenants decide to install a different lock, without permission, when they lose a key. Codes and regulations may make it necessary for you to upgrade your door hardware. Excessive use and vandalism may leave you locked out or vulnerable to break-ins. In either case we'll be able to help you. Call us to have the combination of your digital keypad locks changed, user combinations added or other settings adjusted. We can also reset or troubleshoot your mechanical pushbutton locks. Adjusting a door closer can be very frustrating; If your door only seems to adjust between slamming and not latching correctly we will happily take that problem off your hands. If you do decide to tackle it yourself remember to take your time and make adjustments 1/8th of a turn at a time and avoid having a much faster sweeping than latching speed to prevent excessive stress on the components. Tubular Locks are not only used to secure bicycles and motocycles but on many candy and soda machines, cash registers and tool boxes. We can duplicate or replace your lost keys. Tubular locks are popular not because they are very secure, but because there is a reasonable level of key control as the equipment necessary to cut them is not available to the average hardware store.